I’m not entirely sure what’s driving the dollar here, but it’s acting extremely weak. Even within a relatively new Investor Cycle, it’s struggling to catch any form of a bid. 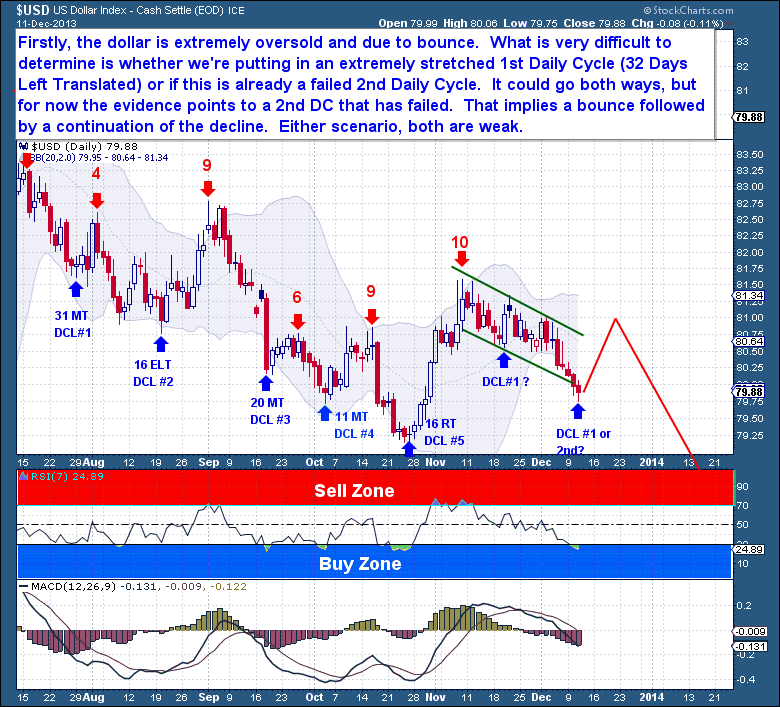 Ever since the summer tapering was put “on hold” by Bernanke, the dollar has shown us nothing but a long series of failed Daily Cycles. I suspect that the FED’s extremely dovish language and its willingness to back it up has resulted in a 3 Year Cycle that is in decline. If we look at the Investor Cycles, it’s pretty clear that the dollar’s character has changed. But for the immediate action, it’s very difficult to determine whether we’re putting in an extremely stretched 1st Daily Cycle (32 Days Left Translated) or if this is already a failed 2nd Daily Cycle. It could go both ways because a long and stretched Daily Cycle to start an Investor Cycle is a possibility. I always try to question every “Cycle failure” that might come up, especially ones which occur relatively early in an Investor Cycle. But we also need to take the longer timeframe Cycles into consideration too. How the longer Cycles are trending most often influence the direction of shorter dated Cycles. 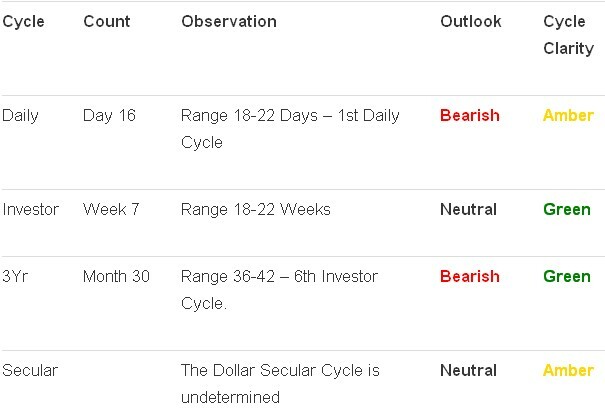 That’s why when this Investor Cycle began on October 25th I said that we should expect a Left Translated Investor Cycle. With a 3 Year Cycle in a failed state, the normal expectation is for the next 2-4 Investor Cycles to be Left Translated. It’s for this reason why I favor the 2nd and failed Daily Cycle as the current scenario. Once the dollar bounces out of the 2nd DCL, expect to see a fairly sharp and accelerated decline down towards the mid 70’s.